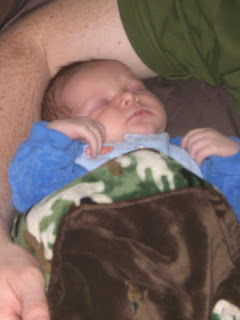 January 27- Here is Dylan all snuggled up & sleeping soundly in the corner of his Daddy's arm. 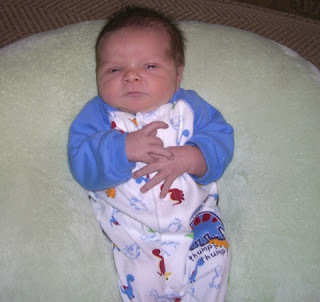 He is almost 3 weeks old now and still pretty mellow & happy-- despite the yucky cold he caught from his big sister. He weighs 8lbs 3 oz now & is changing more everyday! 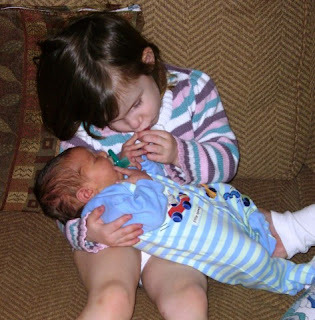 January 17- Savannah is doing such a good job being a big sister and absolutley loves Dylan. She likes to help out with everything and includes him in as much as possible. 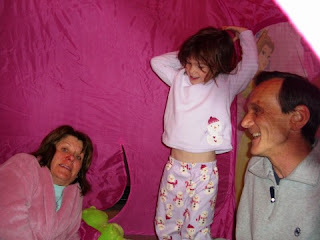 Here they are getting ready for stories before bedtime in Savannah's bed. She would have loved for him to sleep in her bed all night, but settled for sharing her blankie & a story. 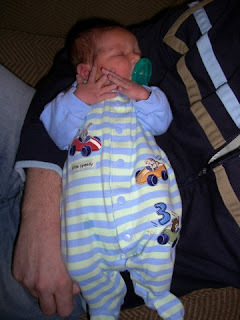 January 17- Here is Dylan at one week. He is doing really well & is already back up over his birth weight. I tried to get a shot of him with his eyes open, but it was a little difficult! This is the best I could do. 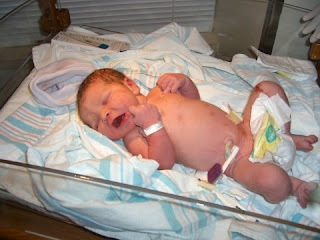 January 13- Here is shot of Dylan after 3 days of being in the world. He is a pretty quiet baby so far, only excercising his lungs when he is hungry or needs changing. We are all enjoying getting to know him! 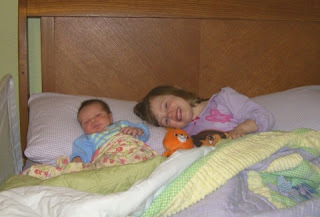 January13- Here is a picture of the VERY proud & excited big sister. Savannah loves her little brother and has been a great helper so far! 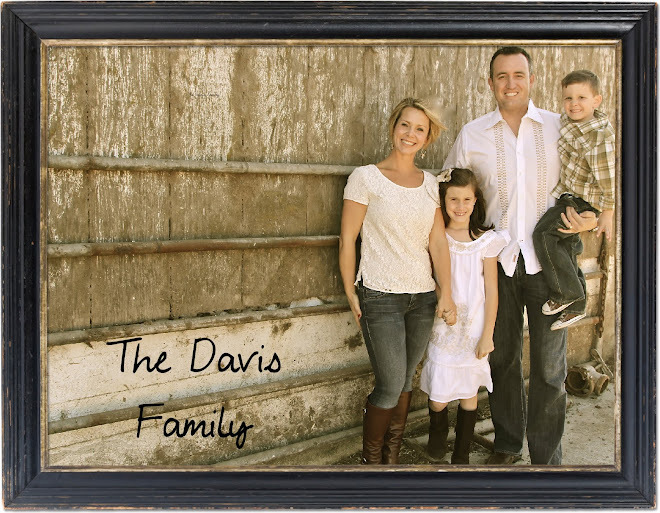 January 10- Dylan arrived on his due date (January 10) after a VERY quick labor & delivery. He weighed in at 7lbs 2 0z and was 20 inches long. 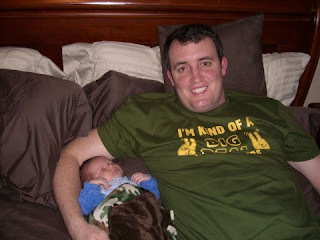 We are home and doing well & so far he is a pretty mellow little guy-- which Mommy & Daddy are very thankful for! 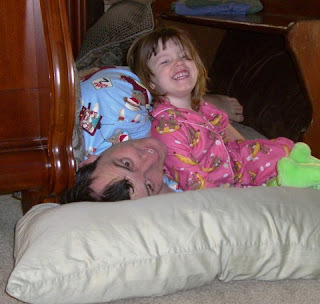 December 26- When I asked Savannah what she wanted to get Daddy for Christmas this year, she answered very certainly, "Monkey jamas and Spider man fruit snacks". So that's what we got him (along with a ceramic wine glass she painted for him because "My Daddy like wine"). 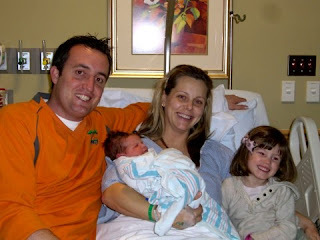 She was so excited for us all to wear our "monkey jamas" together--Savannah & I both already had a pair. Here is a cute picture of Mitch & Savannah cuddling in their p.j. 's together. December 25- Savannah received a costume box from Mommy & Daddy for Christmas filled with all sorts of fun dress up clothes. 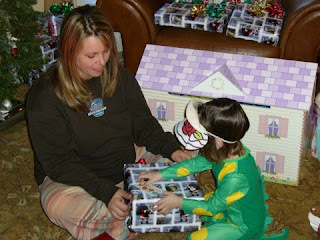 She had a blast opening up all the costumes and trying them all on Christmas morning. Her favorite costume is without a doubt Dorothy the Dinosaur from the Wiggles. Once she opened this costume she had no interest in trying on any of the others and has pretty much had it on non-stop since Christmas. When she is in her Dorothy costume she insists that we refer to her as "Dorothy"and is constantly singing the Dorothy song from the Wiggles TV show. This isn't the best shot of her dressed as Dorothy, but you get the idea. 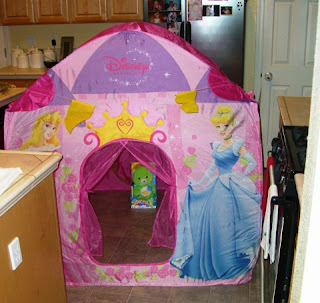 December 25- Savannah received a giant Princess tent & Oopsy Bear from Santa. She was so excited to discover both of these gifts on Christmas morning and has had lots of fun playing with both. 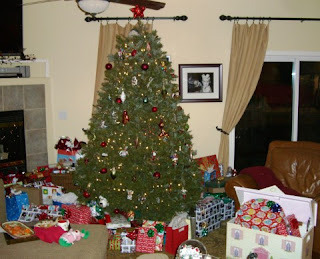 December 24- Here is a picture of our family room once Santa had visited. It is safe to say that Savannah had more gifts than any child ever needs-- but she also had the Christmas spirit and had so much fun preparing for Santa to come to her house! She very diligently made sure that both Santa and his reindeer had plenty of refreshments (cookies, carrots, milk) along with all the necessary amenities to enjoy them (napkins, towels to cover the snacks so her kitties didn't try and eat them). She even left one of her Christmas Care Bears out to keep Santa company.